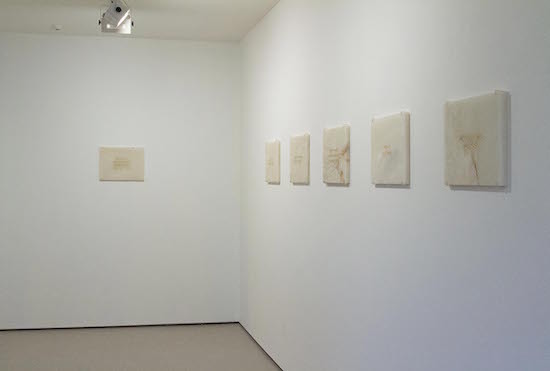 With characteristic wit, Mary-Louise Browne in her new exhibition Picturing continues to use text in lieu of imagery. It is a refusal of the prevalence of images and their authority over imagination today, which the printed word had yesterday and the spoken word before that. Here gilded words inscribed on white and honey onyx -- lustrous and beautiful -- call us, even seduce us, to take time to look, ponder, imagine, feel. Mary-Louise Browne is an established artist with an impressive history of exhibitions and permanent public art works. She has worked at the forefront of text-based conceptual practice for 30 years in New Zealand. Mary-Louise's work broadly investigates the nature of art itself and the role of the viewer in 'reading' and interpreting an artwork. The big questions that she explores are handled with playful lightness, warmth and irony. Alongside this exhibition, we will be showing six works from 1982, which are the subject of a book to be launched at the opening by Small Bore Books, a new specialist publisher in art and design spanning New Zealand cultural production from the 1940s to the present day.